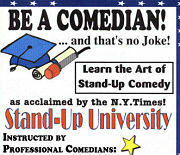 LEARN THE FINE ART OF STANDUP COMEDY AT THE WORLD FAMOUS STAND-UP UNIVERSITY. CLASSES ARE ONLY $295.00 PER PERSON FOR THE FULL 7 WEEK COURSE! REGISTER ONLINE AT WWW.STANDUPUNIVERSITY.COM, OR BY CALLING RICH @516-810-5447. NOW BOASTING OVER 650 GRADUATES ! TAUGHT BY 3 PROFESSIONAL COMEDIANS! ACCLAIMED BY THE NEW YORK TIMES, NEWS12, AND NEWSDAY !